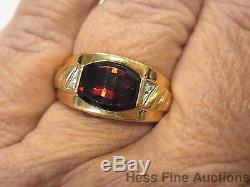 14k Gold Diamond Garnet Mens Fancy Cut Gemstone Vintage Ring Size 9. Described & Photographed By: CHRIS AJP GIA / TQQQ / Please scroll down to see ALL 13 images. 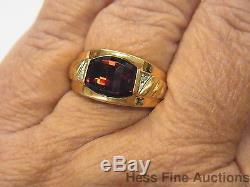 Title: 14k Gold Diamond Garnet Mens Fancy Cut Gemstone Vintage Ring Size 9. 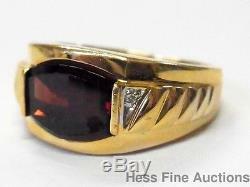 Description: Here we have a vintage mens ring made in solid 14k yellow gold featuring an approx 4ct fancy barrel cut red garnet with a couple of small accent diamonds. 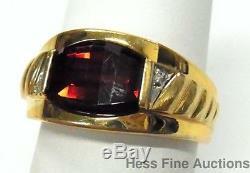 The garnet flashes fiery orange-red when moving in the light - it will not disappoint! 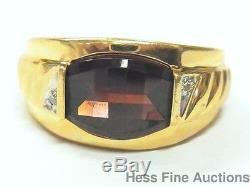 We are offering this with NO RESERVE! Please look at all the pics carefully. Here are the specifications Please note; all stones graded, measured & calculated while mounted. 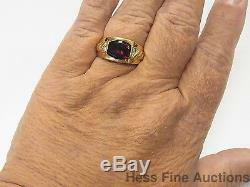 Type of Jewelry: Vintage mens ring. 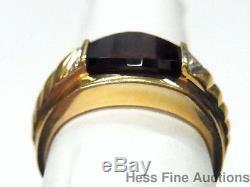 Measurement or Weight of Stones: One 11 X 8mm fancy barrel cut garnet + two 1mm round single cut diamonds totaling approx 4.0ctw. 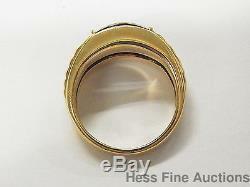 Mounting Metal: Test as 14k yellow gold w/ rhodium accents (a platinum derivative). Manufacture Method: Cast, hand set. Size or length: Size 9. 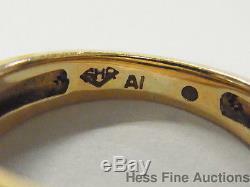 Stamps or Factory Markings: SHR hallmark, AI. Total Weight of Item: 6.6 grams. 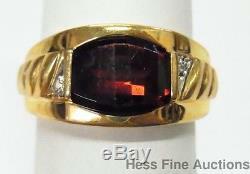 Condition: The garnet shows a few minor surface abrasions on the facet junctions consistent with normal wear diamonds look fine. 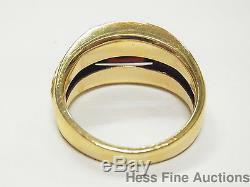 Gold setting has only some light surface wear that a quick buff from a jeweler would remedy. Estimated size of package: 4in X 6in X 2in. Estimated total weight of package: 8 oz. Get FREE counters from Vendio today! Get Vendio Gallery - Now FREE! 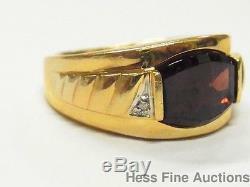 The item "14k Gold Diamond Garnet Mens Fancy Cut Gemstone Vintage Ring Size 9" is in sale since Wednesday, October 05, 2016.